The Latent Image had ads in photograpy magazines, Popular Photography and Modern Photography in the 70's. 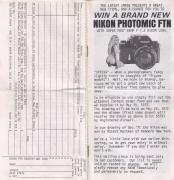 It was around 1977 when I bought some undeveloped film from them to develop and make prints. This is the earliest catalog I have so far. It's the 16 page catalog for Spring 1972. Now we move on to fall 1972. This is also a 16 page catalog of which some sod dared to use the order form which is also the rear cover. So pages 15 and 16 are missing but would be similar to the example above. It's spring; at least it is in 1973 so here's our next installment. Once again page 15 and the rear cover order form (page 16) are missing. Let's go ahead and post the Fall 1973 catalog. The rear cover order form (page 16) and it's backside (page 15) are missing again. Here at long last is The Latent Image Glamour Photo Manual. This book was printed in 1970 and all photography was by Larry Caye. It measures 8.5" x 11" and there are 48 numbered pages plus the covers. The front cover is printed but it's back side and both sides of the rear cover are blank so the complete file contains 49 images. The covers are thick glossy paper but all the other pages have a matte texture which can be seen when the images are enlarged. Here's the 16 page Spring 1974 catalog. The rear cover / order form was used again so it and it's backside (page 15) are missing. Now we have the Fall 1974 catalog. Again the order form was used so pages 15 and 16 are missing. In a rare instance Larry has credited another photographer by name at the bottom of page 3: Johnny Castano. This bio was printed in Figure Photography Quarterly magazine in 1972. They look like a very mod couple. There has been an interesting development in the Magazine Scans section. California Girl #8 features three pictorials by Larry Caye including the cover shot. 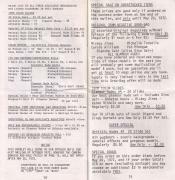 Moving on here's the Spring 1975 catalog. Page 15 and page 16 order form missing again.